Designed for milling cavities in molds. 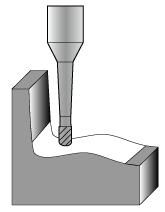 Note: Miniature profile cutters are designed to mill deep cavities in molds. The tapered neck is available in various lengths to provide the most rigid tool for each application. Since interference with the cavity wall is a possibility (see diagram), we suggest the application be verified with CAD by your programmer. Neck is reduced behind the cutter diameter for a length of one diameter.